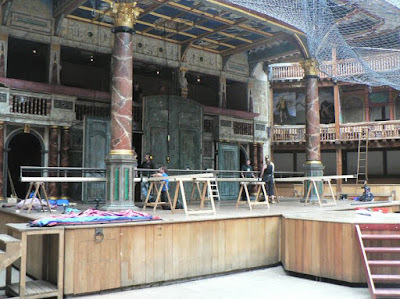 This week we went to the GLOBE! 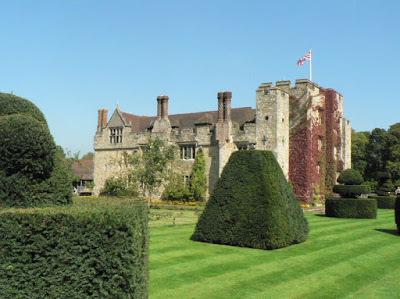 Also we visited the Tate Modern and Hever Castle. 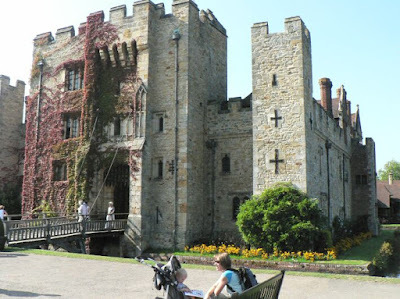 For those of you who do not read Philippa Gregory or pay much attention in history class, Hever Castle is where Anne Boleyn spent her childhood. (you know the second wife of King Henry the 8th, who was convicted of treason and then beheaded). As you can see they are currently undergoing a few changes to get ready for the new show which was to start there next week I think. According to our tour guide the play is Liberty which is a new play about the French Revolution. 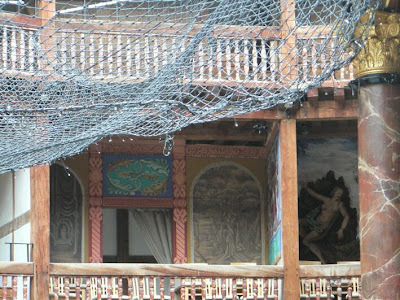 Timon of Athens is currently playing and that is why there is a net fixed up at the present. 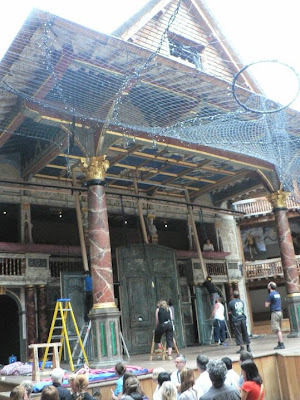 Actors dressed as vultures are going to come out of the top window you can see in picture number 3 and then are going to swoop down thru the holes in the nets you can see in picture 3 and 4. 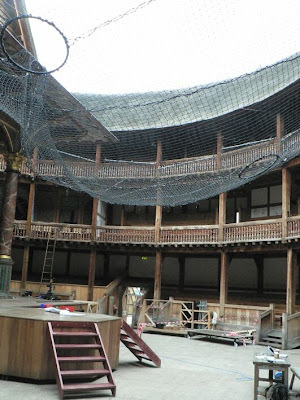 This is designed to freak out the groundlings who are supposed to get rather nervous that they may not have a short enough wire and that they may have a vulture dive bomb them from above!!! They are also performing A Mid Summer Nights Dream which would be my preferred play to see, but to be honest I am not that fussy, I will see anything going! Unfortunately there was no matinee on and we were only in London for the day to meet up with April so we couldn't see anything while we were there. After the Globe we headed to the Tate Modern which for those of you who don't know is an old power station that was converted into an art gallery and is just awesome. It's a really huge space that can have these huge art installations and still feel like it's got heaps of space to fill up! We also found a really cool food market called Borough Market which we want to go back to when we are hungry. . . 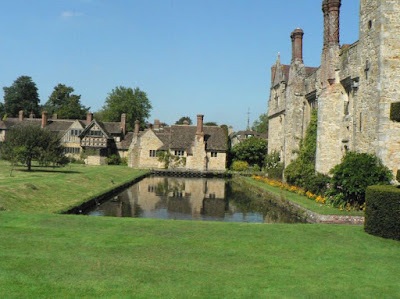 Unfortunately we didn't get any photos of the Yew maze which was mega cool and which we found the centre of (we may have gotten a little lost trying to find our way out, but at least we found the centre!!). 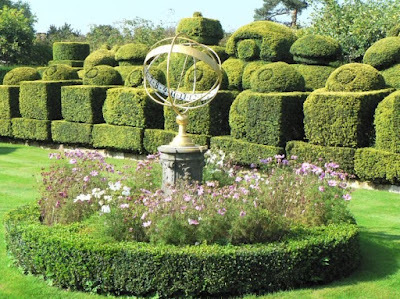 The third photo is actually a sundial standing in front of a topiary chess set done in the style of chess sets from Henry the Eighths time. The gardens there are very pretty!! So, that was the normal part of the week . . . Now for the surprise. . .On Tuesday, we fly to MALTA!! For those who don't know; Malta is a set of three islands just off the coast of Italy (sorta below the boot when looking on a map of the Mediterranean). We will be staying on the largest of these three islands for six nights!! We weren't going to go anywhere, we were going to be sensible and find a job for Amber and look at getting a residence card for Shelley, but then we decided we wanted to go somewhere sunny and within two minutes found that flights to Malta were relatively cheap and then they were booked. We'll settle down when we get back. . . Lesson number one for travellers: BEFORE booking non-refundable tickets to somewhere; check availability of accomodation so you don't start thinking that you might have to sleep on the beach. . .Thankfully we eventually found a hostel which had a twin share private room available for the six nights needed AND that does Airport Transfers (this is important when you are arriving at 3am and therefore will have no public transport). So, no need to worry, we will NOT be sleeping on the beach (very happy about this, just imagine the sand!!). Will write more when we get back from Malta!! Pleased you explaind about chasing Haggis's or is that just haggi. I also third the :jealous of Malta" sentiment!